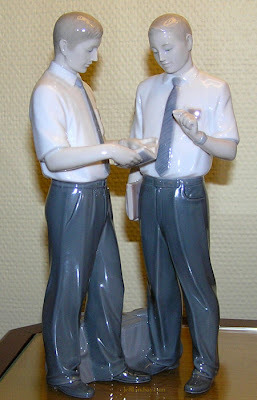 In the summer of 2002, moments before my eldest son entered the MTC for his mission in Argentina, he was approached at the hotel by a woman who said she had an assignment to get a photo of some missionaries for use by Lladró, the famous porcelain figurine maker in Spain. He said OK and let her take some photos of him holding some scriptures. "In a Gangster's Paradise" is an NEA publication aimed at helping teachers wise up to the reality of gangs in the schools. I think LDS leaders might benefit from it as well. If LDS teenagers in a small and famously safe town in the heart of Zion (Appleton, Wisconsin, of course) can end up in jail through gang involvement - and I know a couple who have - then no area is immune. It might be helpful to know some of the signs of gang involvement (or wannabe status). Certain baseball caps or ways of wearing clothing, for example, can point to gang orientation. Take the Gang IQ quiz by clicking above "Gang IQ" at http://www.nea.org/neatoday/0804/feature1.html. Gangs are one manifestation of the secret combinations the Book of Mormon warns about. The Book of Mormon tells us that they are had among all people - a very true statement - and also indicates that, at least for some forms, they have secret oaths and secret signs that can be used to allow members to recognize each other. Interestingly, it describes gangs focused on theft and murder at a petty scale, rebel guerrilla groups that strike from the strongholds in the mountains a la Al Qaeda and the Shining Path, and extremely dangerous groups that organize within the elite ranks of society with the objective of taking away the liberties of a people. And in Ether 8, it prophetically warns that in our day a particular combination will seek to take away the freedom of all nations. I find the Book of Mormon to be remarkably insightful and increasingly essential for an understanding of major currents in our day, and urge that we pay more attention to its repeated messages in this area. Meanwhile, keep your eyes on your young people and help protect them from the deadly influence of your local gangs, as petty and "benign" as they may be compared to the real robbers out there. "Change" is not just a campaign issue in politics, it is a frequent topic of religious debate as well. While "change" can be a winning theme in political campaigns, change is often viewed with fear and suspicion in religion. Not only are people naturally reluctant to change what they believe, but in the Bible we we see that change is often associated with apostasy and rebellion against the ways of God. Of course, that means that divine change is often needed to get people back on track. And the coming of Jesus Christ represented huge changes in biblical religion. For the Latter-day Saints, changes in modern practices or doctrines implemented by LDS prophets are said to be evidence that we are a cult. The argument seems to be that God would never change any commandment or rule, so changes made by LDS prophets must "prove" that the Church is not of God but deserves the negative label "cult." And changes in details of temple worship or other aspects of our practices are often used by our critics to attack our faith. Based on the many changes in laws and commandments documented in the Bible, it is entirely incorrect to say that modern prophets are false if they reveal any changes in practices or rules. The real issue is not whether we agree with them, but whether they are true prophets or not. That question, again, can be answered--or rather, can begin to be answered (that clarification is a recent update)--by determining if the Book of Mormon is true. If it is not, Joseph Smith and all successive prophets in the Church were false. If it is true, then we should be careful not to reject those whom the Lord has called. This Sunday, drop by the Primary (the LDS children's organization) and look at the children as they sing during opening exercises. Then consider that one in every three of them may develop diabetes during their lifetime. This will very likely be a contributing factor in their premature death and will contribute to a significantly reduced quality of life. Some of these children may develop Type 2 diabetes (often called "adult onset" - representing over 90% of diabetes cases) long before they become adults. Once they get diabetes, it means a lifetime of expensive management of the disease and the constant risk of complications. Most of this suffering is preventable. About 80% of type 2 diabetes is preventable by adopting a healthy diet and increasing physical activity. But so many children are at risk because they eat so much junk food, living on empty carbs while getting little exercise. Some of the children you look at this Sunday will soon be victims of the debilitating disease, diabetes. So why not bring a plate of brownies or a bag of candy and pass it around? One parent recently told me how difficult it is to teach good nutrition to his children and keep them on healthy diets, because his efforts seem countered at every turn by well-meaning authority figures. Primary children are often rewarded with cookies, candy, brownies, etc. Ward socials, baptisms, and other events involve high-sugar foods and sometimes little else. And then outside of our sugar-coated religion, school teachers reward kids with candy and sweets, and numerous other events involve sugar-based refreshments. The word "refreshment" is now synonymous with empty carbs. In a Church that places great emphasis on health (the Word of Wisdom) and provident living, it seems most improvident of us to be promoting unhealthy diets that can cause our people to suffer from the largely avoidable plague of diabetes. Are we really building up our wards, or are we building up a future diabetes ward in the way we "reward" and "motivate" our young people? As I look at the economy in the United States, I'm becoming more nervous than ever. The call of the leaders of the Church to be prepared, to build reserves of food and other supplies, to live more providently, is becoming more urgent than ever. The price of wheat has more than doubled in the past year. Any of you with tons of wheat in the basement pleased with the wisdom of your past investment there? I doubt it - it's a sobering development. Other commodities have shown dramatic price increases in the past few years, largely associated with the decline in our dollar. As part of the "stimulus" package for the economy, billions are being handed out - a so called "tax rebate." But those stuck in the highest tax brackets get nothing, and those who pay the least are getting the most. In the old days, this cash handout would be called "redistribution of wealth" and would be immediately recognized as Marxist. Only it's being pushed by so-called conservatives, who are increasingly difficult to distinguish from other flavors of big-government politicians who believe that government needs to spend, spend, spend, implement various forms of socialism, and be in charge of all aspects of our lives in order to take care of us from cradle to grave. Also in the name of helping the "people," certain huge companies like Bear Stearns are getting massive bailouts from the government, meaning that YOU are paying for the mistakes and worthless investments of these companies. And it will come out of your pocket and go into theirs. Don't worry about the $1200 stimulus check the leaders of those banks aren't getting - the millions they get will take away that sting. Another form of redistribution of wealth. I've made some bad decisions in all sorts of area - would you mind bailing me out, too? Don't we all need a bail out? The economy will keep moving forward, the sun will rise, life will go on - but there are dramatic changes looming that call for us to be wiser and more prudent than ever. Build reserves of food, water, cash, etc., and especially reserves of spiritual strength to see you through troubled times. There's a flood of economic trouble coming, and with it will come social trouble of many kinds. Prepare now will you still can, and keep adding to your education and skills in your career to increase your value and flexibility. I hope I'm wrong. I hope we are at a bottom where we will see increasing numbers of good domestic jobs, a stronger dollar, lower taxes, a sound economy, a smaller government, a balanced budget, and a free-range chicken in every pot. I would just love it if all the prophetic warnings about widespread war, hatred, and afflictions of all kinds in the last days were simply irrelevant for the next few generations. But I still think we need to prepare as if grave problems are ahead. Then, when they strike, we can not only help our own family, perhaps we'll be there to bail out our neighbors. That, to me, is one of the greatest blessings of following the prophets and pursuing personal preparation for rough times: it gives us the ability to really help when disaster strikes, just like those in New Orleans who had food and water stored were able to help their neighbors immediately, long before government agencies were on the scene. That's the right way to bail others out. Well, that's just a temporal bail out, but it will be appreciated. Of course, the real bail out that we all need is the eternal bail out offered through the abundant credit of our Savior. That's what we all really need most. But as long as we are in this mortal sphere, we also need food, water, shelter, and other essentials for survivals, so please, be prepared to help. The other night my wife, our youngest son (age 16) and I were reading Helaman 16 in the Book of Mormon. I was in a bit of a hurry and was expecting to just get through the chapter fairly quickly and move on to other things, but after a few verses my son commented on the parallels he saw among some of the opening verses, and as he looked more closely, he asked me if this might be an example of chiasmus - the inverted parallelism (e.g., A-B-C-C-B-A) that modern scholars have found to be a common poetical form in ancient Hebrew writing and other ancient Middle Eastern writings. Before I explain my reaction to his on-the-fly suggestion, here's some background: Chiasmus was noticed in the Book of Mormon in the 1960s by John Welch, and has since become a significant tool in appreciating some of the carefully crafted poetic passages of the Book of Mormon. The abundance of chiasmus in the Book of Mormon is, in my opinion, one of many Hebraic elements that support the plausibility of ancient origins for the text. Chiasmus is very foreign to us and is often difficult to recognize, especially since translation and modern typesetting can obscure the underlying structure. But it's a beautiful thing when recognized. And perhaps the most beautiful example known is found in Alma 36 in the Book of Mormon. But that's another story. A problem with chiasmus is that if you're looking for it, you can find it in places where it probably wasn't intended. For example, you can find repeated words and phrases all over the place in any text, and by cherry picking can come up with inverted parallel structures. John Welch has provided guidelines to judge the chiastic nature of a passage, and these guidelines help rule out many discoveries of enthusiasts trying to spot chiastic structures. For example, it should be relatively tight in structure - not one word ever couple of paragraphs, and should show signs of being intentional (enhancing the message, etc.). As my son suggested there might be a chiasmus in Helaman 16, I scanned the text quickly and didn't see anything interesting, and didn't recall this passage being cited as an example of chiasmus, so, while I was proud of him for having paid attention when I discussed chiasmus in the past, I was about to launch into a paraphrase of John Welch's warnings about chiastic quality to help my son understand that the few repeated words he saw were probably just coincidence and not to get too excited, etc. But first I asked again what he was seeing - and then as he pointed out the places and terms he thought were significant, it hit me: maybe he's right. And as I looked more, it seemed possible that there might be an intended chiasmus here. Not sure, but maybe. Interesting! Below is a proposed structure, based on what my son spotted on the fly during a moment of family scripture study. The actual text from Helaman 16:1-8 then follows. The proposed chiasmus has a very logical focal point: the coming of Christ (like Alma 36, this is literally a Christ-centered passage). It begins and ends with Samuel on the walls of the city, setting the stage for his dramatic encounter with and departure from the Nephites. E'. The time of the coming of various things had been made known unto them beforehand (v.5). C'. The more part did not believe Samuel and became angry when they saw they could not hit him with their stones and arrows. Dr. Joseph Fraenkel, Senior Lecturer in Hallakhic and Aggadic Literature, Hebrew University, Jerusalem. Dr. David Noel Freedman, Director of Program on Studies in Religion, University of Michigan, and General Editor of the Anchor Bible and Biblical Archaeologist. Dr. Yehuda T. Radday, Associate Professor of Bible and Hebrew, Technion, Israel Institute of Technology, Haifa. Dr. Wilfred G.E. Watson, Department of Hebrew, Trinity College, University of Dublin. 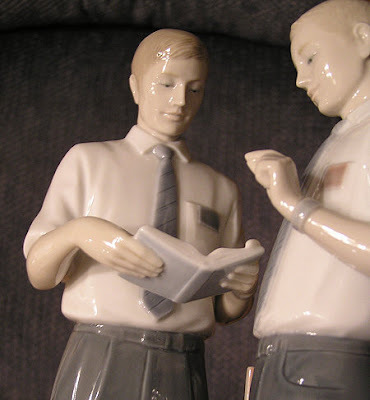 Update: Here's another useful resource: Does Chiasmus Appear in the Book of Mormon by Chance? by Boyd F. Edwards and W. Farrell Edwards, BYU Studies, Vol. 43, no. 2, pp. 103-130 (2004). A hat tip to "Wells." The passing of President Hinckley out in Utah was a major event, one that caused many people to mourn and remember his life. And at first I thought the mourning and eulogies and retrospectives in the media were done appropriately to show respect for that great religious leader. But my opinion changed last week, when the good people of Wisconsin showed me how to really mourn and honor a departed religious leader. When the news broke a week ago about the loss of the leader of Wisconsin's dominant religion, the response was overwhelming. All over the state, believers dressed in black, grown men were weeping, favorable TV stories were endless, and newspapers have featured non-stop inspirational coverage about that beloved leader. Now, a week later, it's still the number one topic in my local paper. Radio stations from Minnesota to Illinois had talk show segments focused on the weeping of devotees, reminding people that it's OK for men to mourn the loss of such an influential man. Our week-long funeral and memorial services out here have shown a new level of respect for those who have passed, one that should give Utahans pause. The Wisconsin example is especially notable when you realize that the honored leader isn't even dead. In fact, he's very healthy, except perhaps for a knee. While the beloved, departed leader has passed - many times, in fact - the mourning came merely from the announcement of his retirement. Brett Favre will no longer be passing with the Green Bay Packers, our leading religion, a noble one, in spite of questionable tolerance for other faiths (grrr to the Bears). Wisconsin: We'll show you the way. It's such an amazing state. Come join us! We've talked a lot about Bountiful and the Arabian Peninsula here over the years. Why not go see for yourself? Warren Aston of Footsteps of Lehi fame actually leads a tour group to Oman to let people see and explore a leading candidate for Bountiful. Correction: looks like they go to both of the leading candidates for Bountiful. Have any of you been on this tour? Would I enjoy it as much as I think I would? Tour information is at BountifulTours.com. They have a tour in October that requires signing up pretty soon, I think. If you've been on other Book of Mormon-related tours, I'd love to hear about your experiences. History can be troubling, for it often challenges the neat views we have of how things are. The reality is that every life is flawed and every hero except the Savior had weaknesses. The problem with history is how easily it can be manipulated. The winners of wars rewrite the history to vilify the losers. Those in power rewrite history to glorify their status and hide their faults. Whether it's the history of mankind, the history of this nation, or the history of the Church, the are several different camps with their own agendas and their own tendency to select what events and data to focus on. All very natural. It's important to understand that what we get from Sunday School might not reflect some of the warts and problems in our own history. But I think it's even more important to understand that "history" in the hands of critics and cynics might completely overlook some of the most important events and data that would be important for someone wondering if there is any merit to the Church and the Restoration. The possible failings of Joseph Smith in various stages of his life take on less significance if we can determine that he actually had ancient golden plates from an angel of God. Think about that. If the story of the divine origin of the Book of Mormon has actual support, and if the Book of Mormon did have its origins in genuine gold plates received with the help of an angel of God - now stop rolling on the floor, this is a serious question! - would that have any impact on how we should evaluate Joseph Smith in light of, say, the Kirtland Bank disaster or the problem of polygamy? I think it must dramatically affect the perspective we take on Joseph. Prophet of God with some human failings, or con man from the beginning? A history of the Church written with the assumption that there is no such things as prophets of God will inevitably overlook important elements. A history written by someone whose goal is not to review history but to challenge faith will suffer much more serious distortions and deletions of data. There is good reason to be troubled by that kind of Mormon history. For those who claim our history is a problem for the church, I have to ask what they are reading for history. Does the history they read include the lives, histories, and testimonies of the witnesses who said over and over again that they had seen the plates and they had seen an angel? Does it include the story of Martin Harris complaining how heavy the plates were as he held them on his lap for an hour and a half? Does it include Martin Harris saying, "Well as sure as you see my hand so sure did I see the angel and the plates"? Does it include Oliver Cowdery speaking of the Book of Mormon translation from his deathbed and saying, "I know that whereof I testified is true. It was no dream, no vain imagination of the mind--it was real"? Does it include the story of Katharine, Joseph Smith’s sister hiding the plates in her bed? Does it include the quote from John Whitmer as he says, "I handled those plates; there were fine engravings on both sides"? Does the history include the many reports from others who also saw angels? Or the 121 independent eyewitness accounts of the mantel of Joseph Smith being passed on to Brigham Young on August 8, 1844, such as the one from nine-year-old William Van Orden who suddenly turned to his mother and said, "The Prophet [is] not dead, for I [see] him on the stand"? An understanding of Church history demands that the witnesses of the Angel Moroni and the many more witnesses of the gold plates be accounted for. Different times, different circumstances, with no one - not single person - denying the reality of what they saw, even when some were later excommunicated or upset with Joseph. To their deathbed, they stayed true to this testimony, with no personal gain to be had. Witnesses, a genuine primary source of information. Understanding the testimony of witnesses, especially the witnesses to the Book of Mormon, is the key to faithful, accurate history. A college student contacted me recently about her conversion story and kindly wrote something to share with readers here at Mormanity. Many thanks to Mandi for having a desire to learn, the courage to consider new possibilities, and the humility to change her life. My story starts two years ago. I was 17, already jaded, and a very unhappy person. I was doing a lot of things that were harmful to me and I was carrying a lot of emotional baggage. I was a staunch atheist, and figured that I would always be that way. One day a friend mentioned one of the beliefs that she held as a Mormon, which sparked an academic interest in the Church. I have always had interests in other cultures and subcultures in America, and Mormonism seemed to be a very interesting and elite group of people. So I went online, looked up all kinds of information about the church, and came away with a very weird feeling. All I was reading about was how awful, racist, cultish, etc. the Church was. None of the Mormons that I knew displayed any of these characteristics. As far as I could tell, they were not involved in some awful brainwashing cult, so I kept looking. Thats when I stumbled across Jeff Lindsay's site in favor of the Church. He presented well thought out arguments...so well that I started thinking that maybe some of what the Church claimed could possibly be true. After reading his site and becoming confident that I would not be kidnapped or served poisoned kool-aid, I asked my friend to take me to church with her. Something amazing happened to me. I began living the standards of the Church. I started living the law of chastity, the word of wisdom, and I stopped cursing. I didn't know why I was compelled to do these things, sense I still didn't really believe in God...but I did know that my life felt so much better and I had energy and motivation that I had never felt in my life. I started talking about the Church with my friends, talking about Heavenly Father and their beliefs. For the first time in my life, I was listening to people speak about their love for Christ and actually GETTING it. It felt amazing. In time, I learned how to pray and gained a testimony of Heavenly Father and His love for me. When the missionaries asked if I wanted to start taking the discussions, I poured over LDS websites (mostly Jeff's! ), reading about the Church and battling any doubts that came to my mind. I decided that I wanted to be baptized, and I have been active in the Church for over a year now. Since I found the Church, my life is 100 percent better. I wake up every day happy and in love with the world. . . . If it had not been for [Jeff's] website, and others like his, I would have had to accept the lies that anti-Mormons put out there. I probably would never have set foot in a church. I can not imagine living away from this Church now, and I would never ever want to. I am just glad that there are people out there who care enough to dispute the lies. So I just want to say thank you to everyone who has written a blog or video about in favor of the Church. Every single one makes a difference, and I can testify to that. To those of you who work to share pro-LDS information with others who are seeking for something, experiences like Mandi's remind us that it can make a difference. "LDS Apologetics" is not about converting people with arguments, but helping people to understand that there may be something more to the Church than what they hear from its enemies. It's about helping them to keep searching, thinking, studying, and praying, to be able to get to the point where they can seriously reach out to the Lord for guidance in their lives. But if the mind has been permanently closed by hostile assaults (cult! non-Christian! evil! ), the journey that might forever bless the lives of humble seekers never might take place. May we all keep working to let the truth about the Gospel of Jesus Christ be known so that those who are seeking for it may experience the rich blessings it brings. The stories of those who accept the restored Gospel of Jesus Christ are so often lilke this, reporting that they are happier, much happier, with a higher quality life in many ways. I'm personally so grateful for the joy and peace that I've found here, and while I recognize there are many paths that bring peace and happiness to people, I think there is something unique and wonderful that we have to share. Thanks again, Mandi! May the Lord bless you richly in your studies and throughout the rest of your life. 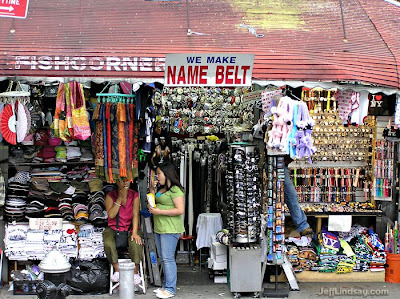 In New York City this summer, my wife and I were walking through China Town with our two younger boys and marveled at the low prices being offered for expensive brand names. I'd heard about extensive counterfeiting, but was shocked to walk into a shop and see the counterfeiting being done in broad daylight. Yes, I know I'm naive! 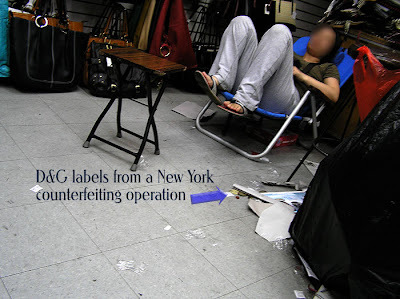 A woman in the back of the shop had been sewing oval D&G labels (Dolce and Gabbana, a hot Italian brand) onto purses. It was like they felt no need to hide their crime. Somehow, my camera accidentally went off while it was down at my side, capturing this shot. My wife was approached by a woman to see if she'd like to buy one of their purses, with prices around $35 each. My wife said no. "Why not?" Very quietly, trying not to be offensive, my wife simply said, "Well, they're fake." The woman became indignant. In fact, she started yelling at my wife. "Of course they're fake!! You want a real one? You go uptown and pay $300." There was no shame. In fact, there was moral outrage and anger that someone would complain about these products being fakes. This lack of shame for sin reflects a studied ignorance of right and wrong, coupled with the ubiquitous human sin of pride. Increasingly, we find that sins people should be ashamed of and keep hidden (if they refuse to repent) become "rights" to be trumpeted in public, with angry denunciations of those who question the propriety of the behavior. Those who practice and advocate sin become celebrities and are given platforms to share their message, while those who object are dismissed as intolerant nutcases. It takes more guidance than ever to maintain one's moral bearings in a world where right and wrong are no longer clearly distinct, but blurs on an ever spinning Wheel of Moral Fortune. Designed to look like every option wins, those who play that game will all be bankrupt in the end. In the warped view of our Shameless Society, wy wife was the sinner for stating the obvious and not choosing to play the game. The following Christmas, of course, was a disappointment: no fake Rolex this year. What, I'm not worth $50? Speaking of fakes and counterfeits, how about that US dollar, now backed by little more than hope? The increasing pace of inflation, fueled by reckless printing of vast amounts of new money, is making the dollar worth less and less at a sickening pace. So what do you do? First, get your food storage built up. Wheat prices and nearly all staples have increased sharply and will continue to increase in the long term. Prepare for difficult times now and invest in food that will last. Commodities in general have increased by over 20% over the past year. And it's not going to stop. Second, get a portion of your savings in silver. Call me crazy, but this is actually a gift to you if you act on this advice, slowly and sanely. Silver was around $7 an ounce 30 months ago when I began recommending it to people. Gold was around $450 an ounce, as I recall. Largely thanks to the steady devaluation of our dollar (and other currencies), coupled with a little increased awareness in the investor community, gold has since climbed to $970 an ounce and silver is at $19.80 an ounce. This may seem like such a sharp increase that it's time to sell rather than buy - and it may be that a 10 to 30% correction could occur in the next 6 months. I sure hope so! And if that happens, buy! But don't count on a large correction. For the long term, it's still cheap at current prices. Silver is the better deal, in my opinion, and is actually rarer than gold in terms of available bullion (it gets used up for industrial purposes, whereas the amount of available gold keeps increasing). So my advice to readers - the dedicated ones who have read all the way to the bottom of this post - take advantage of the currently cheap status of silver and make it a part of your portfolio. Get some of your 401k into a precious metals offering such as the SLV exchange-traded fund and get some of the actual metal stored away in a safe place. Don't count on your stocks and bonds to see you through the inflationary future we are facing.